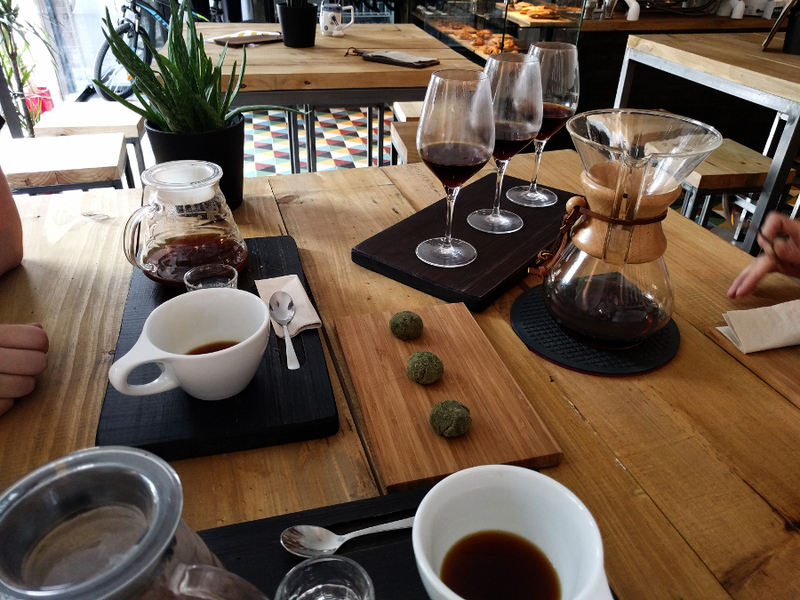 Barcelona has a lot to offer: culture, great food, shopping opportunities, lots of sights – and an exquisite specialty coffee scene. Like usually, I tried to plan this city trip around coffee shops. Still, there was not a lot time to travel around in the city, so I didn’t make it to all coffee shops on my list. 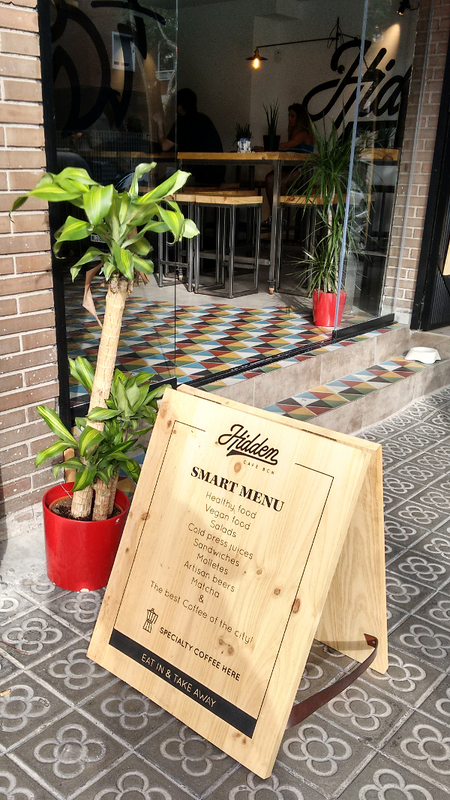 But from those cafés I visited, I picked three highlights (one of them a just recently opened and is a rising star in the Barcelona coffee scene). 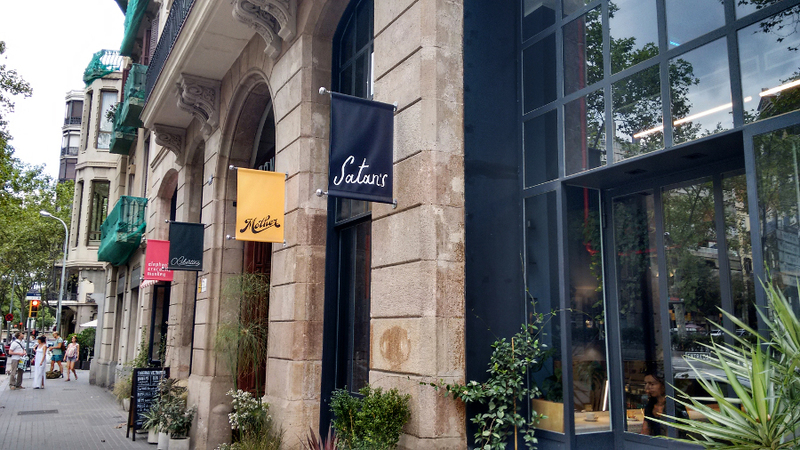 Satan’s has its original coffee shop in Barcelona’s center. Since their second location at “Casa Bonay” (a hotel/restaurant/coffee shop combination with a great atmosphere) was located near our hotel, we visited this spot three times and enjoyed every time perfectly prepared coffee. Those rare occasions of constant perfection make me very happy. 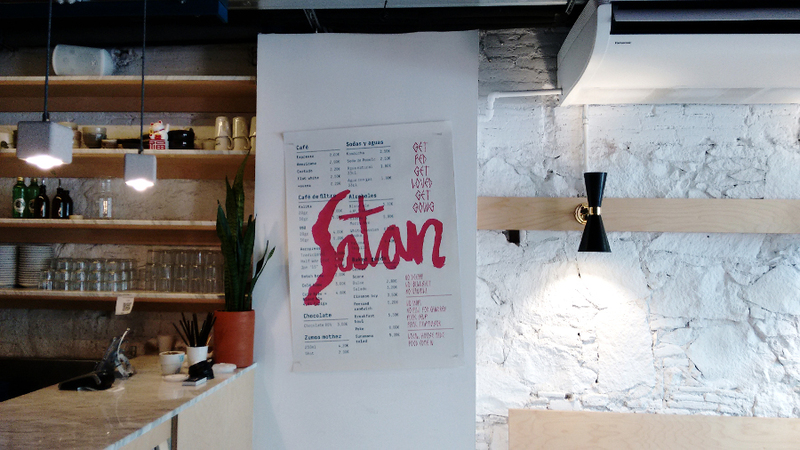 Just that you know what is expecting you: Satan’s serves locally prepared food and locally roasted coffee. The beans I had were roasted a few kilometers south of Barcelona, in Castelldelfels by Right Side Coffee Roasters. I tried a cold brew with their filter Kenya, Filtered Coffee (AeroPress), Espresso, Cortado (those last two ones of course with the espresso roast). My Favorite: the AeroPress “half and half”, a perfect summer recipe that starts with blooming the grounds with cold water and later adding hot water. Just delicious! 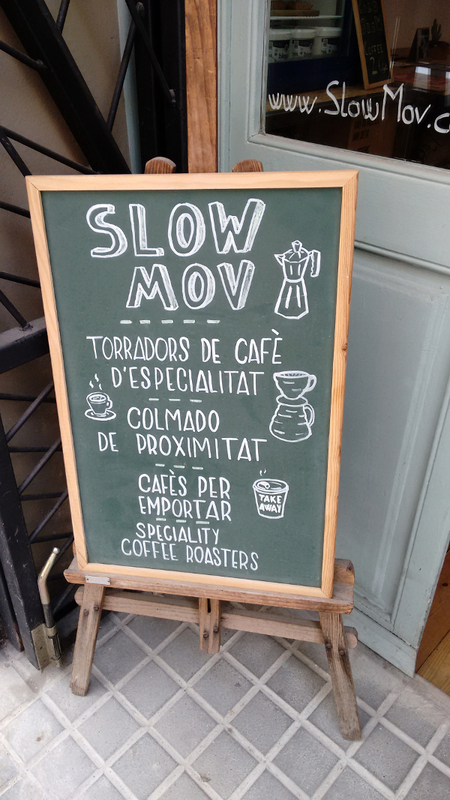 Centrally located near Passeig del Gracia, SlowMov is a friendly and relaxed place to enjoy a fine cup of coffee. The owners Carmen and Francois created much more than a coffeeshop, they built their business around a philosophy. 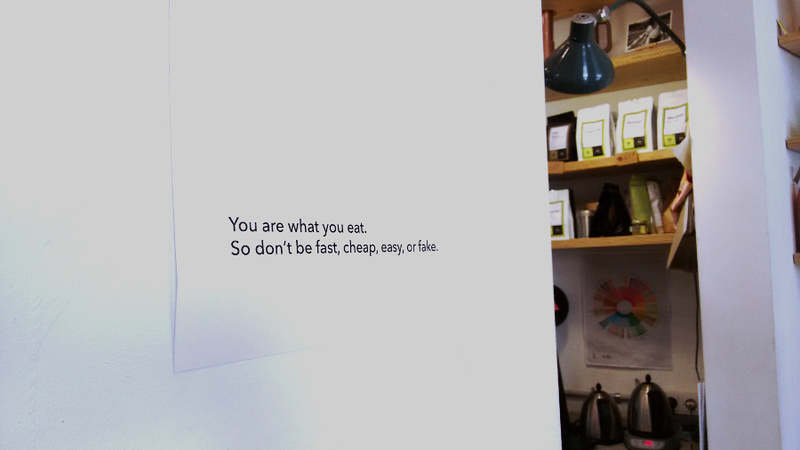 Inspired by the Slow Food Movement, SlowMov is a platform for locally produced food. You can get juices, jams, vegetables and fruit. As you imagine, their coffee sourcing follows the same logic and is imported via Direct Trade is in roasted right inside the café. 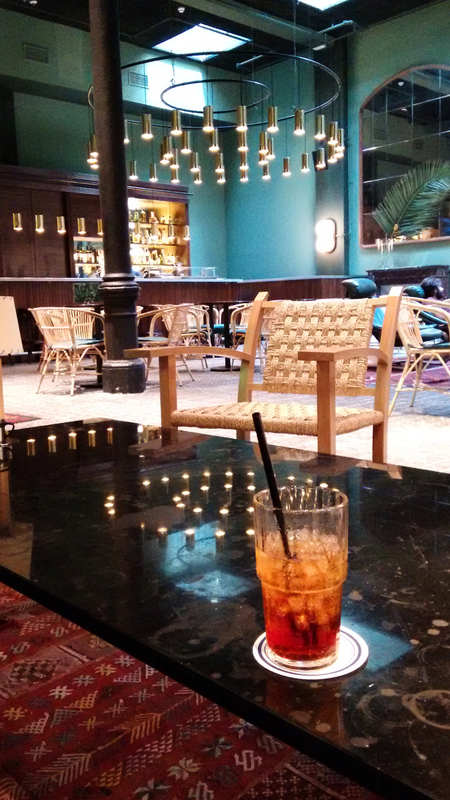 SlowMov is a very nice, quiet space. If you like, you can sit at the big central table and enjoy the coffee. We had a Brasil (Sitio) as espresso and in a flat white. At first, I thought – well, a Brazilian coffee, I don’t know… and wow was I wrong. Purely as espresso as well as in the milk beverage, I was overwhelmed by the complexity of this coffee! 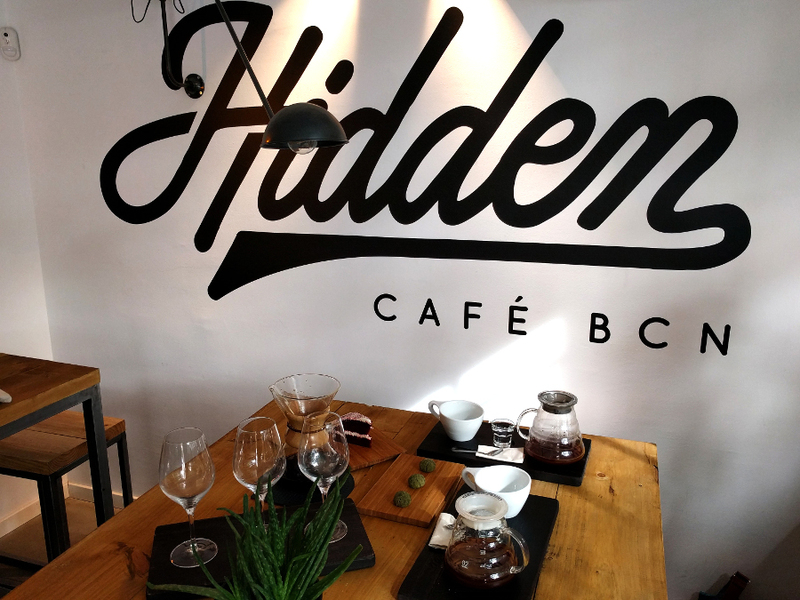 Hidden Café is located in the barrio Les Corts, not far away from the Barca stadium. This stylish coffee shop has opened its doors just recently in June 2016. We had the pleasure of talking to the owner Carlos who is really passionate about coffee. To my envy, they have a personalized Slayer. They serve mostly Nordic roasters like La Cabra or French Roasters like Belleville. Katja, our friend we met on our trip to Ethiopia, and lives near Barcelona, had a Kenyan coffee roasted by Belleville, prepared in a Chemex. Benny enjoyed the same coffee prepared in the AeroPress and I chose a Yirgacheffe roasted from Belleville Brulerie and asked Carlos to prepare his favorite recipe. He made me an AeroPress half and half. I had never tried that before and found that option available in many cafés in Barcelona (as seen above at “Satan’s”). A beautiful space with delicious coffee! Still, I hope, you enjoy the read. 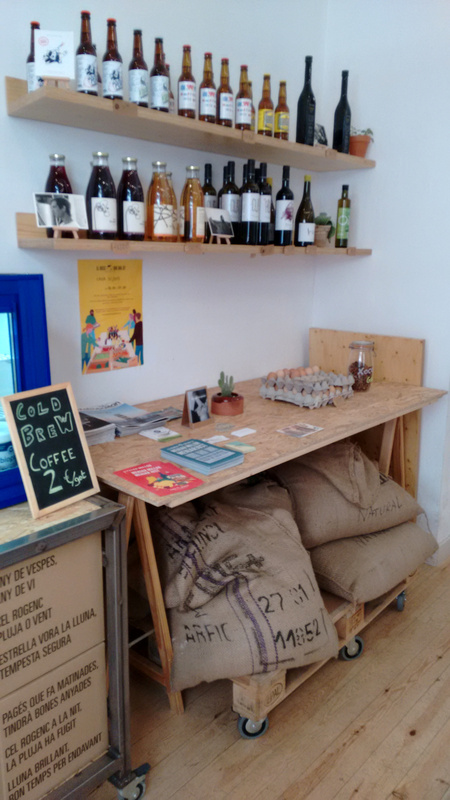 If you prefer a German coffee guide for Barcelona I recommend the first edition of KAFFEE GLOBUS – you’ll find a whole list of great coffee shops there. Thank you for reading! If you like, tell me which Barca coffee shops you visited and liked!